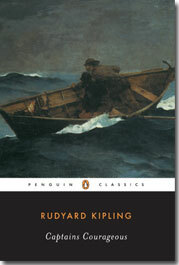 Kipling's rousing seafaring adventure story First published in 1897, Captains Courageous tells of the high-seas adventures of Harvey Cheyne, the son of an American millionaire, who, after falling from a luxury ocean liner, is rescued by the raucous crew of the fishing ship We're Here. Obstinate and spoiled at first, Harvey in due course learns diligence and responsibility and earns the camaraderie of the seamen, who treat him as one of their own. A true test of character, Harvey's months aboard the We're Here provide a delightful glimpse of life at sea and well-told morals of discipline, empathy, and self-reliance.